In a medium skillet, melt the butter over medium heat. Add the red bell pepper and cook for 3 minutes. Stir in the shrimp and green onions and cook until the shrimp are pink and firm, 2 to 3 minutes. 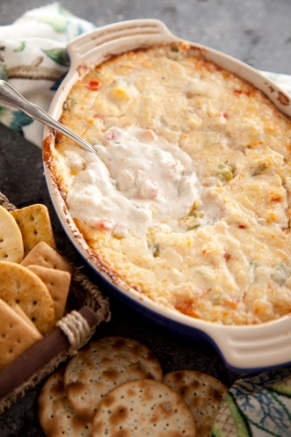 Stir in the sour cream, cheeses, and mayonnaise. Add the salt and pepper, to taste. Spoon the mixture into a 2-quart baking dish. Bake until lightly browned and bubbly, 30 to 35 minutes. Serve with assorted crackers. This entry was posted in paula deen, recipes and tagged cooking, eat, eating, eating habits, eating well, food, home cooking, paula deen, people, recipes, things. Bookmark the permalink. This looks SO good. I want some right now. I’ll be trying this.